Two and a half weeks ago, Lovejoy and Sherman met and the outcome ended in the favor of Sherman in a 2-7 loss for Lovejoy. This time, Lovejoy came out firing on all cylinders. Lovejoy scored 9 runs on 11 hits and committed 2 errors. Sherman was shut out on 3 hits and committed 5 errors. Karson Patterson threw 4 innings of work and hurled 6 strikeouts in the contest. Hannah Bohnenkamper handled catching duties behind the plate. Katie Dolberry and Karson Patterson both hit doubles and Emma Bittlestone hit a triple to lead the charge on offense. Hannah Bohnenkamper went 1 for 3 with 2 RBI. Avery Archer went 2 for 3, stole 1 base, and scored a run. Delaney DiCristofaro went 2 for 3 and scored a run. 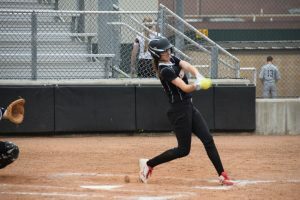 Emma Bittlestone went 2 for 3, including a triple, scored 2 runs, and hit 1 RBI. Karson Patterson went 1 for 3, including a double, scored a run, and hit an RBI. Katie Dolberry went 2 for 3, including a double, scored 2 runs, stole 1 base, and had 2 RBI’s. Mia Chase went 1 for 3, scored a run, and had 1 RBI. Rachel Hoeffner scored a run and had 1 RBI. Lovejoy is now 5-2 in district and 11-3 overall for the season. The JV will go back to work against McKinney North on Friday.